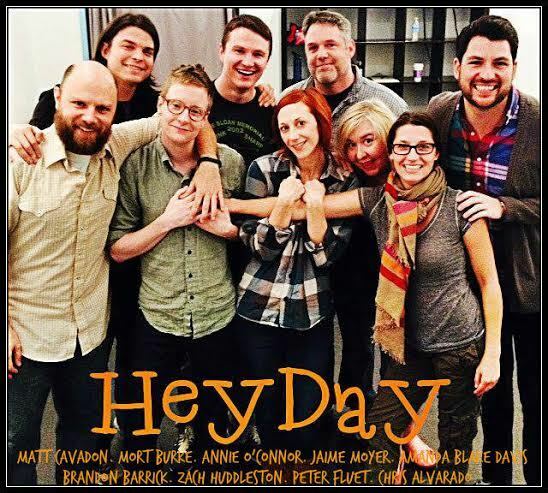 Heyday has quickly emerged as a force in the LA improv community delivering original shows that live up to their WILD CARD WEDENESDAY billing. Winner of BEST HAROLD TEAM at the 2014 Del Close Awards. This troupe lives by the “ensemble” ethos. Heyday is committed to challenging themselves, their work and making shows an overall experience that the audience not only watches but wants to be a part of. Consisting of Zach Huddleston (Kind Strangers, iO Level 3 instructor) Brandon Barrick (Kind Strangers, The Lab w/NOW), Jaime Moyer (Cherry, Two Beer Queer) Matt Cavedon (Big Bennessy), Chris Alvarado (Bandit, Undateable), Peter Fluet (Orpheus Roy, Doctor Who Live! ), Mort Burke (Sad on Vacation, Bargain), Annie O’Connor (NOW w/Annie & Levin, The Lab w/NOW) and Amanda Blake Davis (The Armando Show, The Cherry Pick), Heyday is unique in that they are the only team besides King Ten to have a full hour to perform the Harold. This allows the opportunity for the unexpected with the form and really expand each first beat as much as possible. Under the direction of Karen Graci (King Ten), Heyday strives to create the richest, most fleshed out worlds within their shows resulting in a truly satisfying performances for player and audience. Since June 2014, the troupe introduced iO West to WILD CARD WEDNESDAY, creating must-see-appointment viewing for students and improv junkies alike. Be it free pizza for the audience or breaking Guinness World Records, Heyday loves to give back to the audience with wild and unpredictable results.